Chhoti Si Asha is a non-profit center that offers vocational training and literacy skills to street children of Chandigarh, India. Founded by Liza Chawla in April 2006, the program began when a group of children who used to beg for alms expressed a wish to study. Gradually, the older siblings of these children began attending. "We encourage these children and adolescents to take up work like rickshaw/rehra pulling, tailoring or any other work depending on their interest and ability instead of begging," says founder Liza Chawla. 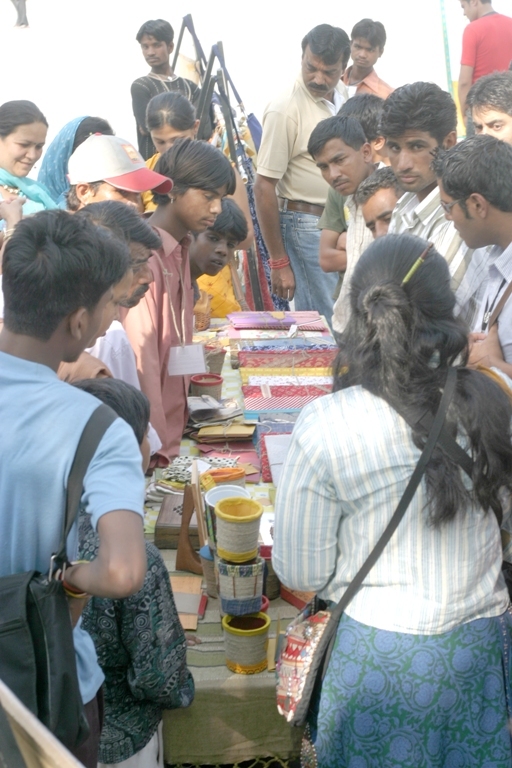 In April 2007, Chotti Si Asha put up its first exhibition in the same market plaza where these children used to beg. Joyshri Lobo reports on the event. Lajpat Rai Bhavan market is a bustling place every day of the week. Named after a great Indian patriot, it runs different programs for the underprivileged in health and education, and it creates tantalizing exhibitions of handmade crafts coming from various corners of the country. As people stream in, they usually don't notice an open space on the side, which houses Choti Si Asha. The area includes a small grassy space with a couple of broken-down sheds, colorful mosaic walls, metal drawers with workers' names, some children's paintings, a few rooms used as living quarters and a modest, circular air stage. There are three shady trees under which five pedal-sewing machines are buzzing away. All are operated by young men who work furiously to complete orders for the day. Choti Si Asha is the brainchild of Liza Chawla, an attractive, slim woman with a pleasing presence and a friendly hold over the lads around her. She is dedicated to a cause: She creates hope among the hopeless and brings dignity and independence to those who had never heard of or experienced either. She is one of the unsung Mother Teresas of Chandigarh. The atmosphere is charged and positive. Visitors are greeted with joy and merriment. Tea is served in chipped cups and finger-scalding steel glasses. Rows of green acorn bags hang out on rods. There is a consignment to be completed. Each amateur tailor will earn from the product he makes. The young men range from 12 to 21. They walk jauntily, with confidence. Liza and her colleague Baljeet have given the magic of self-respect which comes from not having to depend on charity or favor. Sitting on chattais are three little boys sharing a humongous pot of glue, cardboard rectangles, bits of jute cloth and huge cobblers' needles. They are making file covers and neat paper bags of different sizes. We ask Sonny, a boy with green-brown eyes and a brilliant smile, to create a bag. Oozing with a craftsman's pride, he folds, glues and threads a brown paper masterpiece in ten minutes flat. Liza's workforce has its origins amongst the polish boys and beggars at Sector 17. From their attitude it is obvious that they have derived more than just money from working with Choti Si Asha : they consider themselves successful entrepreneurs. Some earn up to Rs. 60 a day depending on their speed and finesse. Bobby and Raja hum film tunes and exchange banter as they work. All wear ear studs, necklaces and bracelets which enhance their sun-burnt, swarthy looks. Sukhmani walks in. She films documentaries and comes whenever she is free to teach the art of costume jewelry. There is a hoard of earrings and bracelets made by small hands. Commando takes us to a trunk full of scraps from boutiques and clothes donated by people. All will go into embellishing strong jute and newar bags. Baljeet helps, measuring and cutting materials. The table she uses is lopsided with a huge hole in the centre, but it serves as a workable tailor's board. Forget ineffectual government projects, bureaucrats and MLAs. The future belongs to inspired people like Liza and Baljeet and the youth they can touch with their magical ideas.